It’s often said that you should never skimp on the things that separate you from the ground. That line of thought goes for tires, mattresses, and of course, boots. But even the best hiking boots require a little bit of break-in. Hiking a trail of any length can be extremely painful if you haven’t properly prepared the boots and your feet. Fortunately, breaking in your new boots is easier than you might realize. Just follow this handy guide from Killgore Adventures! Moreso than fashionable dress shoes, getting the right size and shape boot for your foot is vitally important. Hiking can put a lot of strain on your foot and having uncomfortable shoes or boots from the getgo makes that even worse. Take your time when trying on hiking footwear and don’t be afraid to try a variety of brands and models before you settle on “the one.” Also, don’t buy cheap hiking footwear. Even if you only hike once a year, the comfort and quality of better boots are worth the price. With this in mind, let’s take a look at how to break-in your new boots. Once you’ve found a great pair of well-fitting shoes, it’s natural to want to immediately start hiking. But doing so could leave you with nasty blisters. Instead, wear your new hiking books inside or to work for a few days. You should also wear some cushioned hiking socks and make sure that the shoe is snug, but not tight. Take a second to properly align the tongue of the boot and the gussets to make sure that they sit properly in the shaft of the boot. After you’ve worn your boots inside for a little bit, it’s time to hit the streets. Take a few walks around town or while you’re running errands to the grocery store. After a few more days of this, it’s time to take your new boots to their first hiking trail. Your first outing with your new boots might necessitate a shorter trail than you’re used to. That’s because you don’t want your feet to blister. During your hike, pay careful attention to how your feet feel. 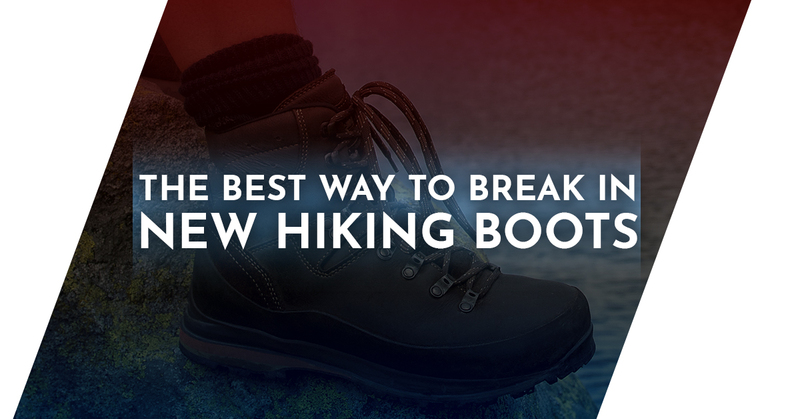 If the new boot doesn’t fit as well as you thought, your feet will let you know soon after starting your hike. As soon as you feel hot spots or blisters forming, stop and treat them. Ignoring them can lead to painful blisters that make it extremely difficult to walk, even in plain shoes. It’s always a good idea to carry some moleskin or duct tape when hiking, especially so in new boots. You can also limit the amount of wear and tear you put on your feet by wearing thin sock liners under your hiking socks. The liner helps to remove moisture from your skin, preventing blistering. Similarly, you can try re-lacing your boots throughout the hike. Make sure that the forefoot of the foot is snug. This keeps your foot from shifting too much in your boot, which could cause pain. If you want to know some different strategies for lacing your boots, check out this great video from REI that teaches you how to lace your boots to address foot pain. Some hiker lore suggests that if you soak your boots in the bathtub before hiking you can accelerate the break-in process. Others recommend bending the toe box of the boot and wrapping them in rubber bands to get them to stretch. Some old school hiking advice even suggested urinating in your boots to help break down the stiff leather. All of these tips are weird, and even kind of gross. All they result in is soggy, ill-shaped boots that smell funny. Skip these tips and instead just gradually use your hiking boots more and more until they feel like a second layer of skin on your feet. Trust us on this one, you’ll thank us later. With your new boots broken in, it’s time to get moving. Plan your next hiking expedition for Hells Canyon in Idaho! Killgore Adventures offers a unique jet up and back service that allows you to take our jet boats up the Salmon and Snake rivers to all of your favorite hiking spots. Book your spot on our jet boat today!